Is Mattel, Inc. (NASDAQ:MAT) A Good Stock To Buy? We at Insider Monkey have gone over 700 13F filings that hedge funds and prominent investors are required to file by the SEC. The 13F filings show the funds’ and investors’ portfolio positions as of September 30th. In this article we look at what those investors think of Mattel, Inc. (NASDAQ:MAT). Mattel, Inc. (NASDAQ:MAT) shareholders have witnessed an increase in activity from the world’s largest hedge funds in recent months, not enough to be included in the list of the 30 most popular stocks among hedge funds in Q3 of 2018. Mattel shares surged after the company reported a third-quarter profit ahead of the all-important holiday season. Although falling short of projections, they signal Mattel’s progress towards the path of profitability. In the year-ago period, Mattel reported an adjusted loss of 4 cents per share on $1.56 billion in revenue. Mattel Chairman and CEO Ynon Kreiz said the company posted year-over-year growth in operating income for the first time in eight quarters. The company reported third-quarter operating income of $121.9 million, representing 41% growth from $86.2 million in the comparable year-ago period. For North America, Mattel said its sales increased 4% year over year, the highest sales growth for the region since the 2015 fourth quarter. The company also noted its sales saw a negative 3% impact from the liquidation of Toys R Us and the slowdown in its China business. Hastings Margaret Mary Georgiadis is responsible for the last major insider purchase, acquiring 12,660 shares at $19.61. The shares currently trade at $13.95, a discount of 28.86% to the price paid by Georgiadis. Let’s take a glance at the key hedge fund action surrounding Mattel, Inc. (NASDAQ:MAT). 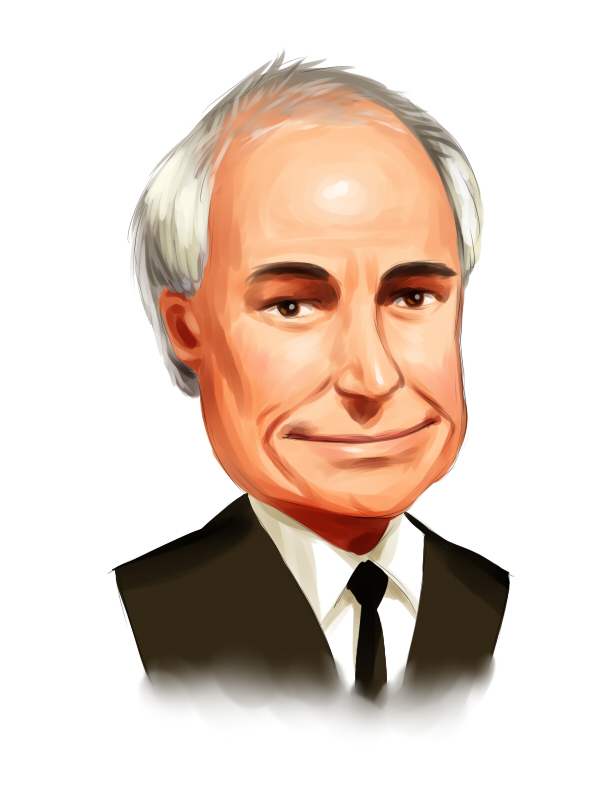 How are hedge funds trading Mattel, Inc. (NASDAQ:MAT)? At Q3’s end, a total of 16 of the hedge funds tracked by Insider Monkey were long this stock, a change of 14% from the previous quarter. 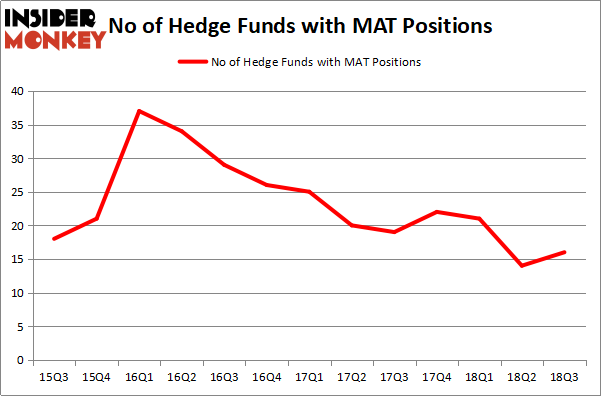 The graph below displays the number of hedge funds with bullish position in MAT over the last 13 quarters. With hedgies’ capital changing hands, there exists a select group of noteworthy hedge fund managers who were adding to their holdings significantly (or already accumulated large positions). The largest stake in Mattel, Inc. (NASDAQ:MAT) was held by Southeastern Asset Management, which reported holding $581.7 million worth of stock at the end of September. It was followed by Ariel Investments with a $178.4 million position. Other investors bullish on the company included Point72 Asset Management, Citadel Investment Group, and OZ Management. Now, key money managers were breaking ground themselves. Point72 Asset Management, managed by Steve Cohen, created the largest position in Mattel, Inc. (NASDAQ:MAT). Point72 Asset Management had $33.6 million invested in the company at the end of the quarter. Israel Englander’s Millennium Management also made a $4.9 million investment in the stock during the quarter. The following funds were also among the new MAT investors: Ken Griffin’s Citadel Investment Group, Kenneth Tropin’s Graham Capital Management, and Martin D. Sass’s MD Sass. Let’s also examine hedge fund activity in other stocks similar to Mattel, Inc. (NASDAQ:MAT). We will take a look at United States Steel Corporation (NYSE:X), First Citizens BancShares Inc. (NASDAQ:FCNCA), RenaissanceRe Holdings Ltd. (NYSE:RNR), and Elbit Systems Ltd. (NASDAQ:ESLT). This group of stocks’ market valuations match MAT’s market valuation. As you can see these stocks had an average of 18.25 hedge funds with bullish positions and the average amount invested in these stocks was $347 million. That figure was $838 million in MAT’s case. United States Steel Corporation (NYSE:X) is the most popular stock in this table. On the other hand Elbit Systems Ltd. (NASDAQ:ESLT) is the least popular one with only 2 bullish hedge fund positions. Mattel, Inc. (NASDAQ:MAT) is not the least popular stock in this group but hedge fund interest is still below average. This is a slightly negative signal and we’d rather spend our time researching stocks that hedge funds are piling on. In this regard X might be a better candidate to consider a long position. Hedge Funds Are Crazy About Weyerhaeuser Company (NYSE:WY) Here is What Hedge Funds Think About Mastercard Inc (NYSE:MA) Is Omnicom Group Inc. (NYSE:OMC) A Good Stock To Buy? Here is Why You Should Buy Alphabet Inc (GOOGL) Now Should You Buy The St. Joe Company (NYSE:JOE)? Do Hedge Funds Love CorePoint Lodging Inc. (NYSE:CPLG)?